Architect Cassidy Logan has sworn off good-looking adventurers. Newly divorced, she’s focused on building ecologically friendly, historically accurate homes on the Chesapeake Bay for her father’s construction company. Traveling to Cannonball Island—where there has been no new construction in nearly one hundred years—Cass is sensitive to the heritage of the island and has come up with plans so perfect she’s determined to buy a home for herself. Even the fact that Owen Parker—a local who she dismisses as a lightweight and a player—seems to be everywhere isn’t enough to deter her from building her dream house. Owen Parker is and always has been sinfully handsome and wickedly clever, a magnet for mischief as well as girls. He’s a rolling stone, going and doing whatever appeals to him, from flying a mail plane in Alaska to working on a cattle ranch in Australia, a shrimp boat in Louisiana, and surfing and diving in Costa Rica. When an old friend offers him a job salvaging a sunken ship on the Chesapeake Bay, Owen gladly accepts. Something’s been telling him it was time to head home to Cannonball Island, and a job is as good an excuse as any. And he’s totally smitten by the pretty architect on the scene, but it seems he’s finally met a woman who’s immune to his charms. Sooner or later, Owen will have to face the reason why he always runs, because this time, leaving just might be harder than staying. I do not like starting a series either in the middle or at the end of a series. I always feel like I am missing something. 9 out of 10 times, the book always references back to the earlier books in a series. I know people are asking “Why review then“. Simple. I love to read and sometimes, not always, there is a book that you can read alone from the series. The Chesapeake Bride is such a book. While it is the 11th, yes 11th! !, book in The Chesapeake Diaries series, this can be read almost as a standalone book. I say almost because there are scenes where I wished I had read the other 10 books. 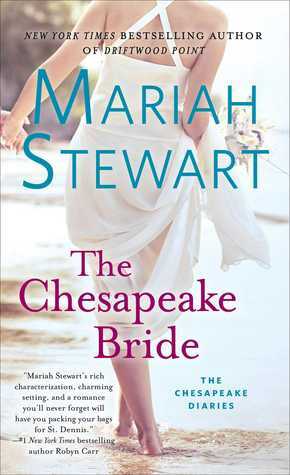 The Chesapeake Bride is a cute, fast-paced romance with a few curveballs thrown into it. With truly imaginable characters and a great storyline, you will get sucked into the book. Definitely a book that I will recommend to people!! It was a very fun book and I wanted to cry when I saw it was book 11…lol. But, it is almost standalone, so I was able to read it without wondering “What are they talking about”…lol. lol!!! Exactly. And that is how I get sucked into having a huge TBR pile….lol.